Living in a war-torn nation such as Afghanistan means that educational and economic opportunities are extremely limited for men and women alike. Though agriculture is the country's most important industry, much of the land has remained uncultivated because of civil strife and drought. The Global Partnership for Afghanistan helps women gain financial security for themselves and their families by teaching women farmers how to replant their land and revitalize their farm businesses. Suzanne Thompson from the GPFA board of directors discusses their work. After decades of war and Taliban control, women across Afghanistan are striving to overcome a legacy of repression and scarce educational and economic opportunities. Though women comprise 60% of Afghanistan's population and a major portion of the agricultural workforce, their participation is meagerly rewarded. Many have lost husbands, brothers, sons and fathers to the conflict and are struggling alone to support their families. 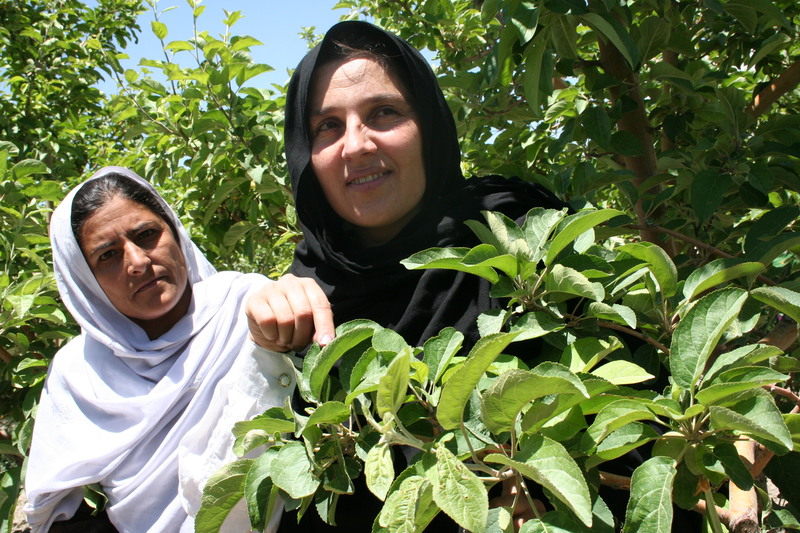 In 2005, just a year after rolling out our first orchard and nursery trial enterprises in Afghanistan, the Global Partnership for Afghanistan (GPFA) launched an initiative to help women farmers collaborate and build a better future for themselves and their families. With help from village shuras (councils), GPFA identified widows and other female heads of household who lacked the supplies, training, tools and funds to replant their land. Since then, GPFA has helped establish or revitalize orchard, nursery, forestry and other woman-owned farm enterprises. More than 30 female agricultural extensionists and facilitators are working with across 9 provinces. 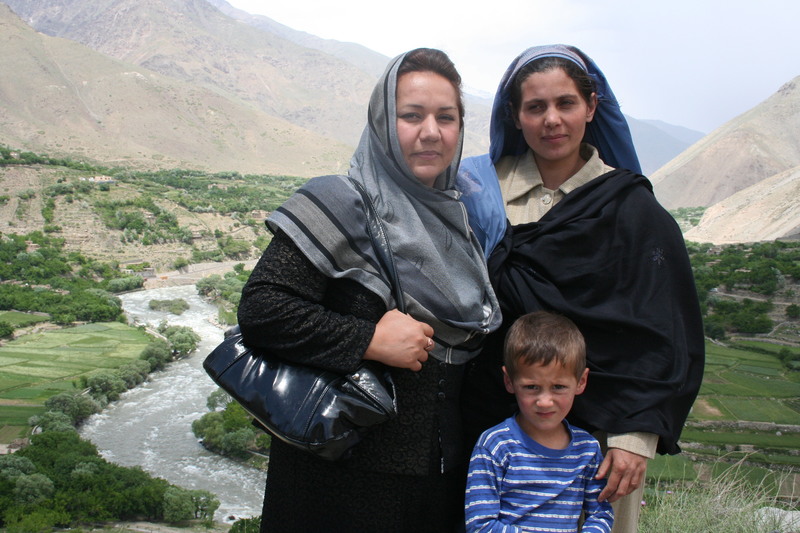 In all, some 35,000 Afghan women and girls are benefiting from GPFA's programs. Hamida: An Entrepreneur in the MakingIn Paktya province, Hamida joined GPFA's orchard revitalization program in 2008. Hiding her lined and weathered face from the camera with her bright green chador (she refused to be photographed), she explained that she planted her orchard 16 years ago with six local varieties of apple. Production had dwindled to a few diseased apples when Sakina, GPFA's female extensionist, helped her radically prune and fertilize her 200 trees. That fall, she sold 3,500 kilos of apples for $4,000, in sharp contrast to the $600 annual income of her 55-year old husband, Abdul Shakoor, a taxi driver. But Abdul beams with pride as Hamida tells how she expects still more production this year - with Sakina's orchard management training. He smiled as Hamida grabbed his smooth hand to contrast her calloused palms. Her income is the primary support for the 16 people in their household. Now Hamida has a vision. She's seen the cold storage facility GPFA helped another Paktya woman construct with her neighbors. With GPFA's help, Hamida and 15 of her neighbors are forming an association through which they hope to construct a cold store facility. "Now we sell at harvest time when the tekadar (trader) comes and prices are low. But if we could store our fruit, I could nearly double my income." Afghanistan, Sakina and other staff explain, is on the cusp of great change, but progress has its challenges. Producer associations must be registered at the Ministry of Justice in Kabul, and women like Hamida cannot travel freely to the capitol due to cultural constraints. "The women and the men of Paktya are strong," Sakina says. "They were on the front lines as Afghanistan resisted the Russians." With time and resources, GPFA and Hamida will find a way to overcome these barriers together. Woman to Woman: The Multiplier EffectVillage by village and woman to woman, GPFA is helping women to themselves transform women's work into women's livelihoods. Fatima Sardar leads GPFA's Women's Program which helps women like Hamida. Fatima needs only to recall her own experience when visualizing the potential of Afghan women in the workforce. Forced to flee to Pakistan when Afghanistan erupted into civil war in the 1990s, she was unable to complete a university degree. When she returned to her native Paktya province after the fall of the Taliban, Fatima committed herself to ensuring that other Afghan women could pursue their educations unfettered. After several years working for international NGOs, Fatima joined GPFA's staff in 2007. "Fatima has long been a powerful advocate for women in Afghanistan," says Roger Hardister, GPFA's Executive Director. "Whether she's working with government officials, other NGOs, village women or our own staff, she commands the respect of everyone she meets. She understands their needs." With help from GPFA, Fatima is continuing her own education as well through a grant that enabled her to join other GPFA senior technical staff on a study tour of commercial horticultural centers in Turkey. "We saw firsthand how a modern horticultural business works," said Fatima. "We are using our new skills to help women improve their farm income back in Afghanistan." Fatima is providing ongoing instruction in horticulture and small business management to women like Sausan in Kabul province. Like Fatima, Sausan was forced out of school by the Taliban. But today, as a GPFA village facilitator, she earns $165 a month by helping to train and monitor women farmers in her community. Since taking part in GPFA's Women Working Together initiative, these rural women have seen their earnings and food supplies increase by as much as 60 percent. "Women like Fatima and Sausan are the lifeblood of GPFA's women's programs," says GPFA Executive Director Hardister. "They are ensuring a lasting legacy for our work." GPFA's WorkGlobal Partnership for Afghanistan's focus on improving the livelihoods of men and women in rural Afghanistan is a model for economic development in challenging conditions. Almost two-thirds of Afghan families live near or below the poverty line; their lives and their land have been devastated by three decades of war. 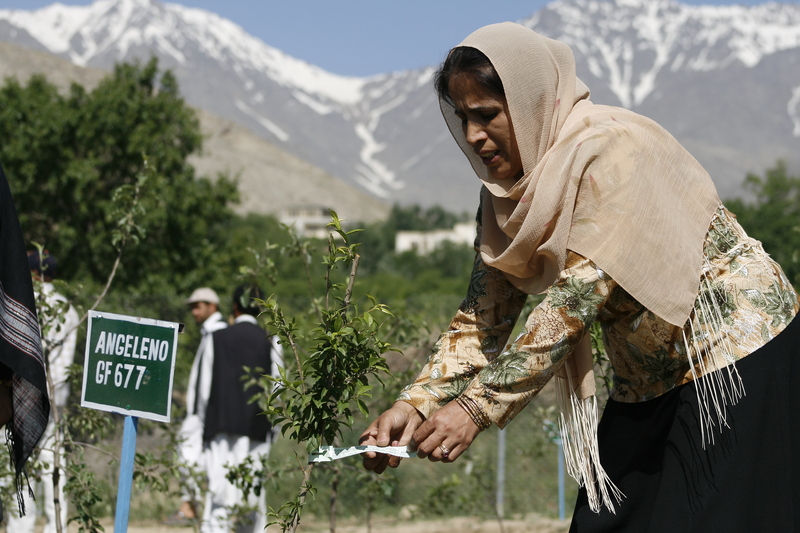 GPFA helps Afghan women build tree-based businesses from poplar woodlots to orchards for about $1,500-$2,500 each. These small enterprises produce dividends for years to come. It takes $1,000 to revitalize an orchard like Hamida's while smaller investments can help a woman plant an agro-forestry plot or vegetable garden. An investment of $7,000 for an underground fruit storage facility will enable 10 families to preserve fruit and vegetable harvests until the optimum selling period, helping them to gain a fairer share of the market value of their crops. GPFA's expanding reach extends to providing technical and business training, strengthening university agricultural programs, improving water management, revitalizing forests, and more. 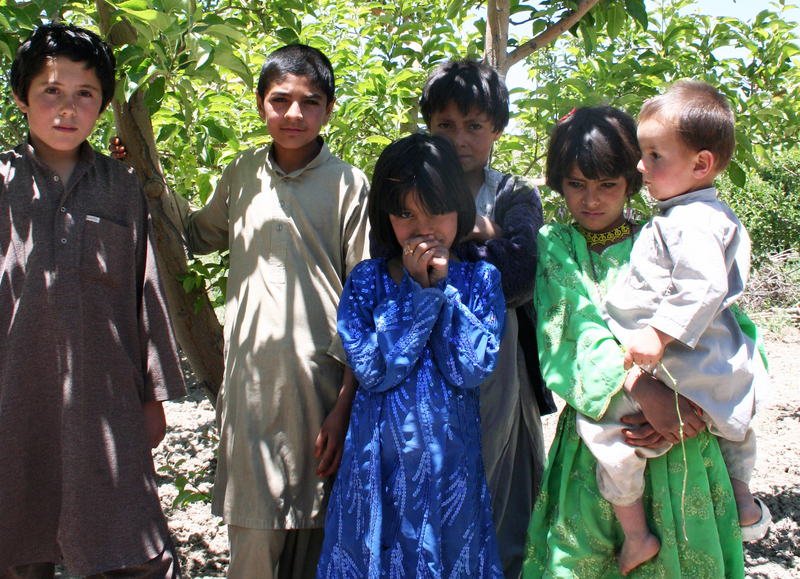 Farmer-owned enterprises--woodlots, nurseries, orchards, and vineyards--are the cornerstones we use to build partnerships with local communities and help Afghans build sustainable incomes for their families. GPFA's farmer businesses, growing steadily in number, now benefit over seventy thousand individuals; the resulting increased income also promotes personal pride and community stability. To learn more about Global Partnership for Afghanistan, visit www.gpfa.org.